President Benigno Aquino III had welcomed the biggest Commercial airplane in Ninoy Aquino International Airport last October 7. 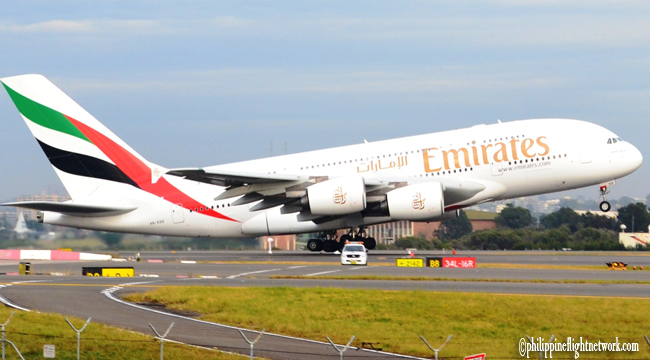 Emirates Airbus A380 had graced the NAIA runway and was met by water cannons as a salute and welcoming. Despite that NAIA was dubbed as the world’s worst airport, Pres. Aquino was happy to welcome the Emirates Airlines officials and personally meet its Filipino pilot Capt. Franklyn Desiderio. The bus was reported to have 300 passengers when it landed in NAIA past 10pm of October 7, 2014. The arrival of the plane proves that the Terminal 3 can handle the size of the plane. Having such a large plane in the airport needed to have a lot of requirements, but prior to the landing of A380, the website Wallstreet CheatSheet NAIA was called one of the worst airports in the world with staff impoliteness as one of the reasons. Emirates has 53 AirBus 380’s and the one that landed in NAIA Terminal 3 is only a one trip. This is only used to prove the capabilities of the Terminal 3. The plane left at 1am this morning. Pres. Aquino also wanted to personally see the operations in the Terminal 3 as 5 major airlines to decongest NAIA terminal 1.